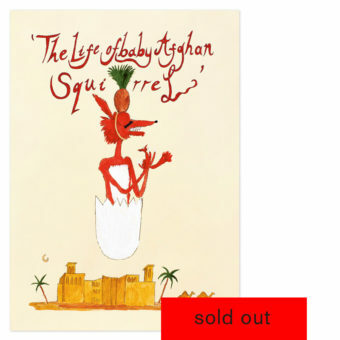 The booklet in a hardcover shows seven drawings of important stations and events in the life of the ‘Baby Afghan Squirrel’, who was in peaceful resistance against the British occupying power in 1842. The letter of the figure of ‘Holy Brocoli’ on the back contrasts a seemingly naive with a very drastic pictorial language on the front. By mixing iconographic and religious time levels, Andrew Gilbert also alludes to the supremacy of contemporary great powers.